Born - July 8, 1956 in Israel. Doctor of Medicine, Ben-Gurion University, Israel, 1984. Resident in obstetrics and gynecology Kaplan University Hospital, Rehovot, Israel. 1985-1991. Chief physician Ob/Gyn Hadassah University Hospital, Jerusalem, since 1993. Research Fellowship in reproductive sciences - Barns Jewish Hospital, St. Louis Miss. USA 2003-2004. 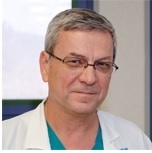 Associate Prof. Ob/Gyn Hebrew University, Hadassah School Medicine, Jerusalem since 2009. Head of high risk pregnancy outpatient clinic, Hadassah Ein Kerem medical center. Head of high risk pregnancy outpatient clinic, Hadassah Ein Kerem medical center. Head of Maccabi women outpatient health center in Jerusalem. Vice Dean&dasg; Student affairs Faculty of Medicine Hadassah Hebrew University. Contributor of over 100 articles to professional journals and author of 3 books in Obstetrics Gynecology and Reproduction (Hebrew).